I’ve been on a bit of an unconscious break from middle grade sci-fi and fantasy. I continue to want to pick these titles up, and I’ll borrow from the library or buy, but they’ve (for the most part) lain in unread piles around the apartment. Why this malaise toward a genre I love and spent several months reading exclusively as a judge for the 2013 CYBILS awards? Just that, I think—too much exposure in too short a time. But as I said, this has (until very recently) been unconscious on my part. I didn’t realize I was avoiding them until I read a really lovely set of middle grade sci-fi graphic novels. When I was done, I looked around for other MG books to compare them to – and found that I’d gone into a black hole in 2014. 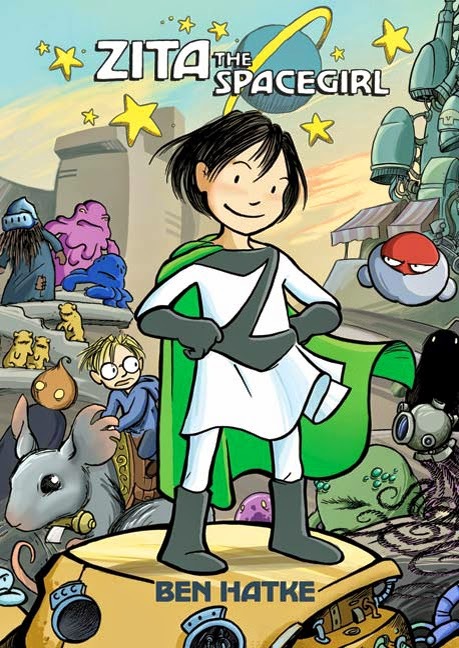 Well, you’ll be happy to hear that Ben Hatke’s Zita the Spacegirl books have cured me, and I can’t wait to dive back into to wonderful middle grade sci-fi and fantasy. While romping outdoors one day, Zita and her friend Joseph discover a device embedded in the remains of an asteroid. When Zita presses a button and a flash of light swallows Joseph, she is frightened, but determined to follow and rescue him from his uncertain fate. So begin Zita’s adventures in space – for using the device has catapulted her through a portal and onto another planet, into the midst of a whole host of unknown creatures. Zita will have to exercise all of her wit, courage and kindness to survive (and find a way home). The absolute star of the piece (as the title suggests) is Zita. She’s adventurous, brave, loyal to friends new and old, and stuck in the ultimate uncomfortable situation. When she can’t immediately rescue Joseph she uses her strengths to find the path to a solution. Zita is tenacious, and she’s just the active, non-violent heroine for a rescue operation. As for setting, Zita has landed on Scriptorious, a planet that everyone is desperate to flee due to an approaching asteroid. The scenes in the market, when everyone is trying to get off-world, reminded me of the same predicament in the first Men in Black film. There are enough strange and amazing creatures filling the pages to stretch any imagination. Zita’s especial friends are Piper (a shifty, tinkering humanoid), Mouse (a giant mouse whose collar spits out paper communiqués), One (a flying, armed battle ball) and Randy (a mish-mash robot with wheels for legs). Together they are a motley, unstoppable force held together by the glue of Zita’s friendship and purpose. Ben Hatke has created a colorful world for Zita to venture through, and while the comic panels vary in size, the art is uniformly lovely. The landscapes vary – some are Earth-as-we-know-it, and others bring to mind Tatooine from Star Wars or Wall-E’s waste-ridden future Earth. Zita herself could belong to one of many nationalities or ethnic groups, and I believe that is a huge point in the book’s favor. She’s drawn in such a way that the reader may make his/her own conclusions. Overall, this is an engaging read with a heroine who relies on the power of friendship, trust and ingenuity to succeed. While Zita the Spacegirl is certainly sci-fi, there are enough whimsical touches (the Pied Piper who owns a tube of doorpaste, for instance!) that this graphic novel will please fans of fantasy as well. Recommended for: fans of Kate DiCamillo’s Flora & Ulysses, and anyone (ages 8+) who enjoys speculative fiction, true heroism, and stories about friendship. Fine print: I received a free copy of Zita the Spacegirl for review from the publisher. I did not receive any compensation for this post. This really is such a fun series.